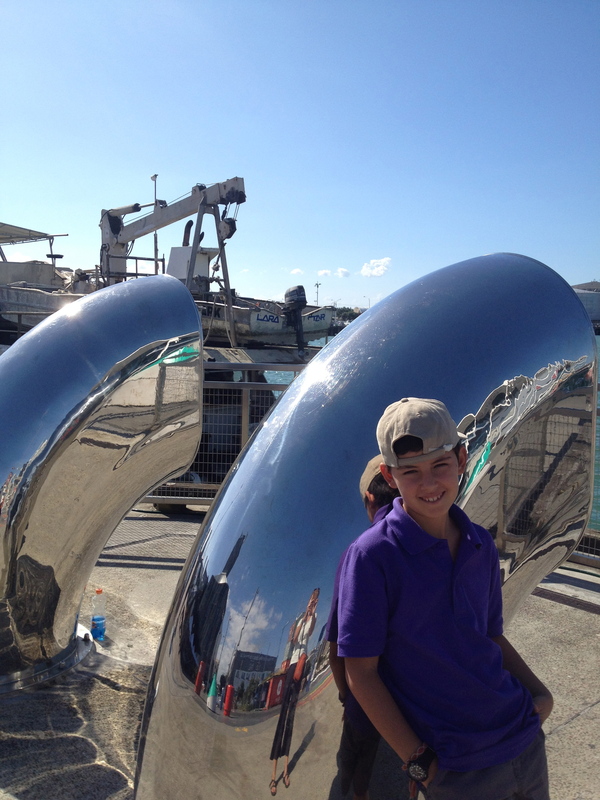 Kia Ora or Welcome to New Zealand, the youngest country in the world! This beautiful, far-away land of rolling hills, gorgeous lakes & mountains, volcanoes, aboriginal culture and lots and lots of sheep, has always intrigued me. Perhaps this is because I grew up with a Dad that was surrounded by wool and sheep all his life. Being the director of a woolen cloth manufacturing plant, he so much idealized the little lamb (as they gave him the quality wool for his yarn), he vowed never to eat one (and so neither did we as a family!). When our travel agent told us that the cheapest way to get from SE Asia to South America, was via New Zealand and Fiji Islands, I was thrilled. We arrived in the capital of Auckland after an 11.5-hour flight from Malaysia. Following an eventful night (where I miscalculated the time difference which landed us on the street without accommodations at 2:00 am in the morning! ), we were ready to explore the city. Auckland seemed so very modern and sophisticated to us, after 6 months of China & S-E Asia…as well as incredibly expensive! But thank goodness for the fabulous big kitchen at Attic Backpackers (www.atticbackpackers.co.nz/), that not only provided us with the opportunity to make our own meals again (although weird being back in the kitchen after almost 8 months), but also gave Filou the chance to repeatedly play the 4 songs he had just learned (to the delight of the young backpackers, some of whom even wanted to learn his cool tunes!) on the wonderful blue piano that was housed there. On our first day, we took in the crisp, sunny air and headed towards Auckland’s well-designed and colourful waterfront area. From oversized chairs to stunning boats and brightly painted crates and silos – the area was delightful to stroll along. We even took in a free video-arts exhibition in one of the silos, where we sat down in beanbags and lied on oversized cushions while seeing the most stunning nature scenes of New Zealand pass by on screen (each video was accompanied by an original piece of beautifully crafted music). Guided by the brilliantly crafted questions from the book Living on the Loose (www.familyontheloose.com), the children had 2 fabulous hours of art discovery at the Auckland Art Gallery – Toi o Tamaki (http://www.aucklandartgallery.com). 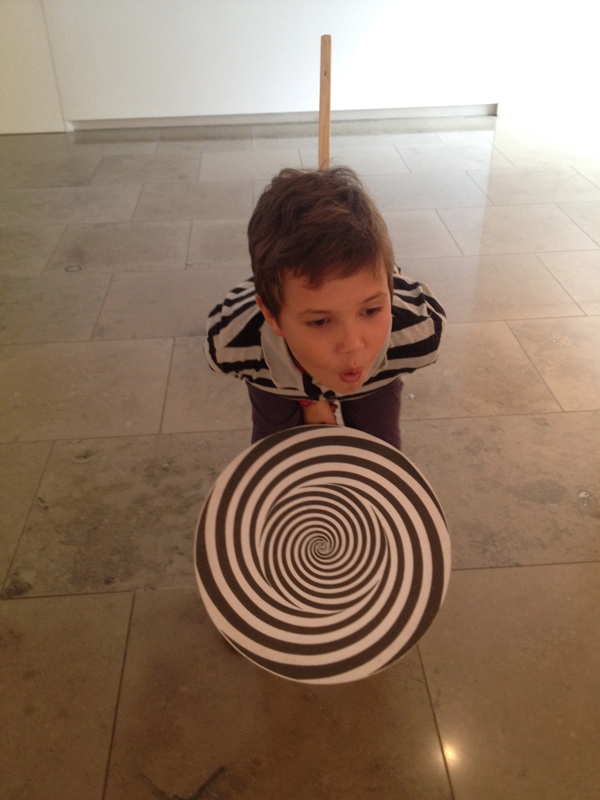 To properly discover a few of the 15,000 visual arts pieces there, Emile and Filou went on a mini-art scavenger hunt and skillfully answered questions and made art drawings – visiting a museum this way was great fun! And this free gallery, located in the World Building of the Year 2013, houses such an eclectic collection of art pieces, that we all had an informative and enjoyable afternoon. To further explore the North Island (unfortunately we did not have enough time to also see the South Island during our 2-week stay), we bought ourselves the handy Volcanic Explorer Pass from Intercity (http://travelpass.intercity.co.nz/itineraries/North/7), and travelled by bus from Auckland to Rotorua to Taupo to Tauranga and back to Auckland. Rotorua (the Maori name for “second lake”) is a city on the southern shores of Lake Rotorua in the Bay of Plenty area (2.5 hours south of Auckland). The city is well-known for its geothermal activity, geysers and hot mud pools, so one our our first visits was to Wai-O-Tapu Thermal Wonderland (www.waiotapu.co.nz). We rented a cute little Mini for the day (appropriately named Little Blue by the boys), and travelled along Thermal Explorer Highway (SH 5) to reach this scenic reserve & thermal area. This conservation zone is literally covered with collapsed craters, cold and boiling pools of mud, water and steaming fumeroles (opening in a volcano, through which hot sulfurous gases emerge). 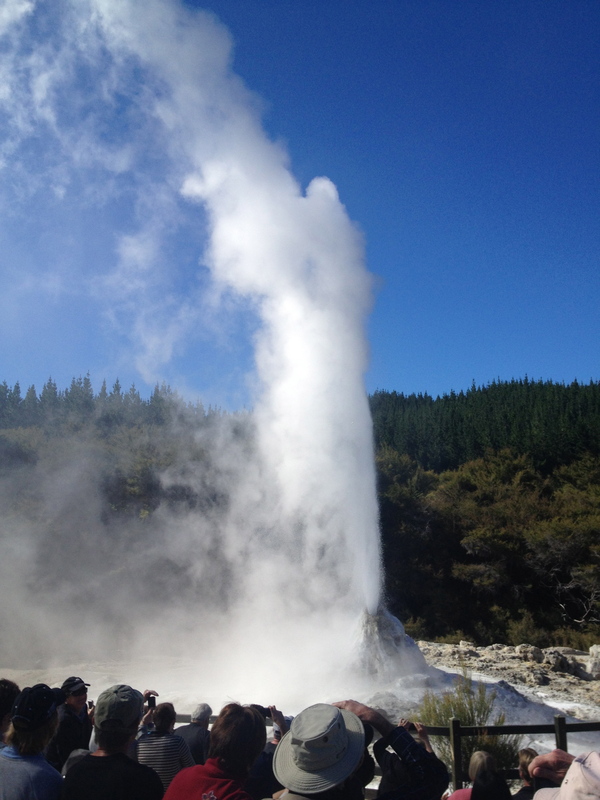 Wanting to take it all in, we started off by witnessing the Lady Knox Geyser erupt. Although helped a little by a small, eco-friendly soap deposit, it was pretty spectacular to experience as it reached heights of 10-15 metres! Before we set off on our exploratory walk through the park, we visited the fascinating Mud Pools; violent, boiling, plopping mud that smelled of rotten eggs (due to the hydrogen sulphide – H2S). 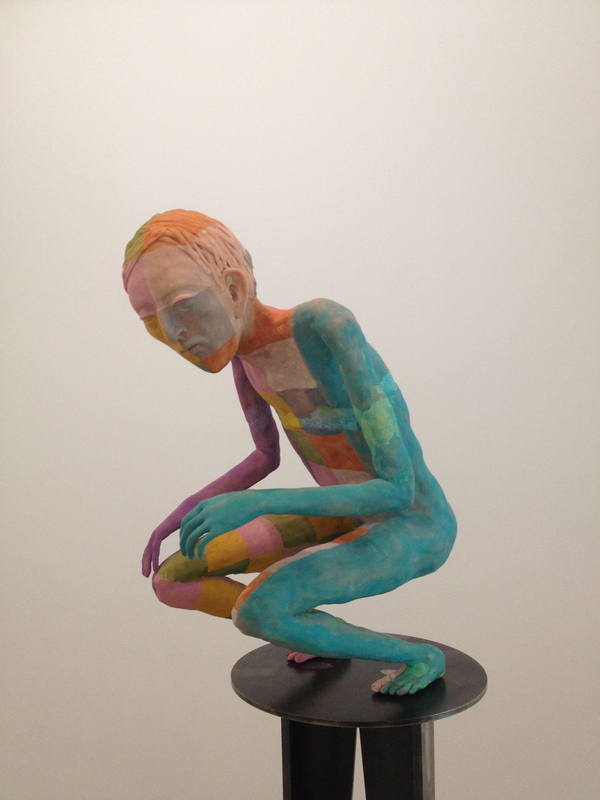 After a quick look, we moved on and soon after reached the Artist’s Palette and Champagne Pool – undoubtedly the favorites, due to their innumerable colours (which are all natural tints; there because of the numerous minerals). The Champagne Pool, which apparently is unique in the world (as it has a fifth of a hectare of bubbling, hissing water), has a beautiful, ochre edge. And the Artist’s Palette, a panorama of hot and cool pools and steaming, hissing fumeroles had an amazing variety of ever-changing colour (yellow, green, orange, red-brown etc.) which we could observe up-close as our walking path went right over it. Thank goodness nobody veered from the path, as beneath the ground we would find a system of streams which are heated by magma left over from earlier volcanic eruptions; temperature: 300C! The most bright and colourful of pools was Devil’s Bath, located near the end of our park-journey. The water was so incredibly green – almost fluorescent; it seemed like it had walked away from a movie set, where someone had wanted to use some enhanced colouring to make for a better scene – WOW! 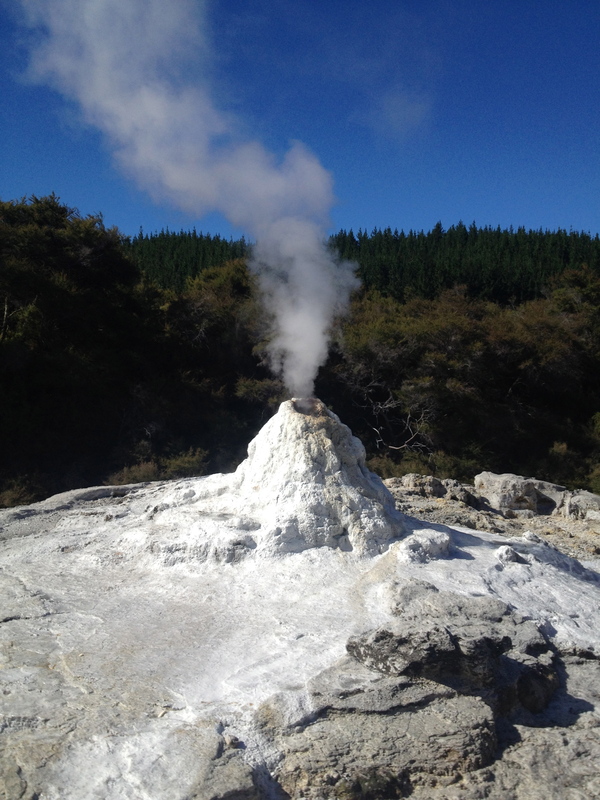 The sheer beauty of Mother Nature was evident in the sizzling earth, rising steam, colourful springs and huge volcanic craters at Wai-O-Tapu. 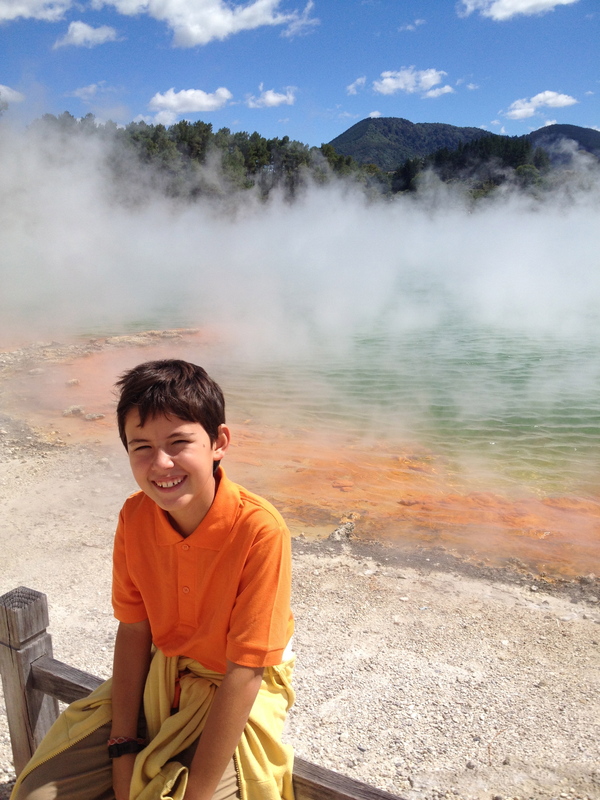 Emile was most impressed with the huge craters – well over a dozen, some formed by eruptions, others by internal chasms. 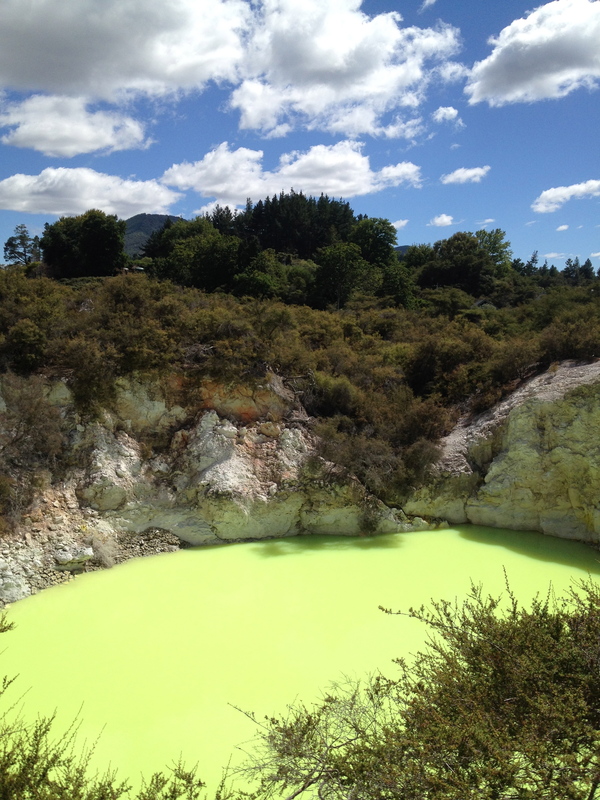 They were certainly impressive, and after our exploratory morning, we all understood why Wai-O-Tapu (sacred waters) is known to be New Zealand’s most colourful and diverse volcanic area. 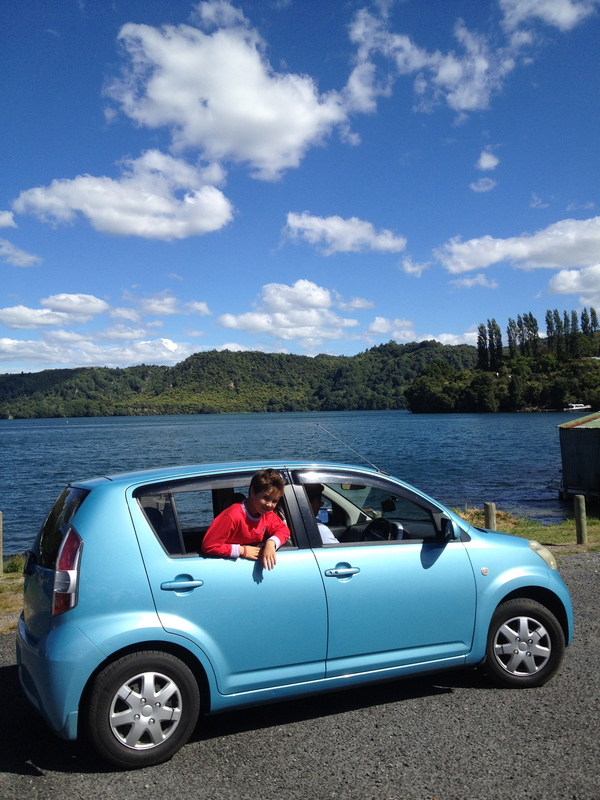 In the afternoon, we took our Little Blue and drove along the many gorgeous lakes in the area. Our first stop was Blue Lake, a stunning deep blue lake – a favorite local hotspot for boating and swimming (although it was very windy there, the water was particularly warm). The lake also boasted a fantastic large climbing structure and play-park, where the children had great fun climbing into the sky and making friends with local Kiwis. From there we continued our trip and ended up on another lake where we saw black swans, and Emile and Filou gave a fun dance performance on a local dock. Following some tea and scones at the coffee shop of an excavated Maori village (buriedvillage.co.nz/), we were ready to head back to our wonderful home-base: Rotorua Central Backpackers (www.rotoruacentralbackpackers.co.nz). 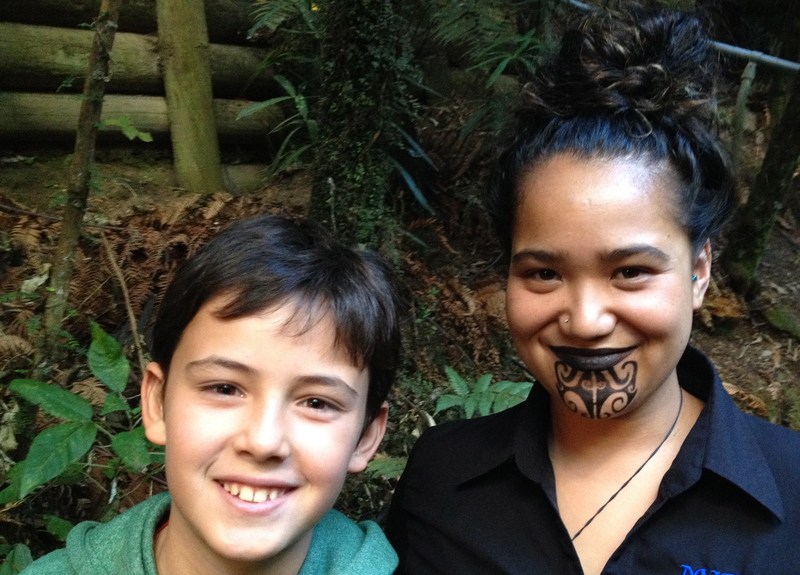 To learn about New Zealand’s indigenous people & their way of life, we spent an evening at The Mitai Maori Village (www. Mitai.co.nz) – a sacred and spiritual place that was created by the local Mitai family. As this Maori tribe had no means of written language, all their history is passed down through story telling, songs and carvings – means by which they teach the younger generations, and educate the “outsiders” – while offering a unique, cultural experience. Our evening started off by a brief introduction about the Maori people and some impressive welcome words by our evening’s host (he welcomed all 27 nations present in their native tongue!). We were then invited to the unveiling of our traditionally cooked hangi meal. Large trays of lamb, chicken, stuffing and kumara (sweet potatoes) that were all steamed in a hangi pit, were lifted from the ground and shown to us. We were totally salivating already (the smell was so good), but our show was first. 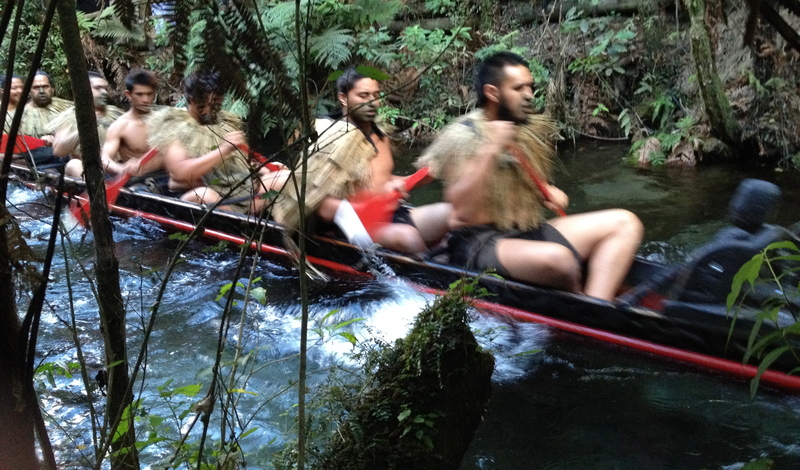 We walked through a natural bush setting and reached a small body of water; the Wai-o-whiro stream. Warrior chantings became more and more audible, and slowly a hand carved waka (war canoe) with 5 traditionally dressed and menacing looking warriors appeared. What a unique experience! We then, moved to an open-air theatre were we were welcomed by the Maori Chief. He taught us that the Maori originate from Polynesian, particularly from the Tahitian Island. That they are related to the people of Tahiti, Cook Islands, Hawaii, Easter Island, Samoa, Tonga and many more. Their language is similar, although their culture is different. The Maori tribes have inhabited New Zealand for over 2000 years and in this country, they all speak the same language although they are made up of over 70 main tribal groups. The Mitai family then captivated us with displays of weaponry and combat, and with the beauty of their songs and dance. Filou’s favorite was definitely the poi dance (poi dancers swing weights or balls on a taura – cord, and move them in a variety of rhythmical and geometric patterns). In Maori, poi is practiced by women only, although its first use was by men who developed wrist flexibility for the use of weapons, by repeatedly hitting the inside of their wrists. Last but not least, the Maori Chief explained the significance of the Ta Moko to us. The Maori people are decorated with the Ta Moko or tattoo art that covers large parts of their faces and legs. On their faces, the men have 4 birds; the bat (wisdom), the parrot (skill in speech making), the owl (protection) and the kiwi bird (protection of Mother Earth). The women only wear the owl on their chins. The men’s tattoos, located on their legs represent ocean waves that mean power and speed. The spiral on their backsides represent Mother Earth and energy patterns of Mother Nature found in the wind and waters. To show off their tattoos and scary facial expressions (wide eyes and menacing looks; the scarier the Maori warrior looks, the more beautiful they are considered to be), the Mitai family gave us a final expressive dance full of quick, determined movements and loud screams. Then, with this appropriate farewell message: Ma te kaihanga kotou e tiaki e manaaki i roto I nga haerenga katoa (let the creator guide and protect you in all your travels), the performance was concluded and we were on our way to a scrumptious dinner (I promised the kids I would try the lamb – sorry Dad – and I have to say that it was quite tasty. They thought it was “outta this world”). On our way back to the bus we walked once more through the bush where we saw glow-worms in their natural habitat and observed crystal clear water full of trout. All in all, we had a very informative and fun evening with the Mitai Maoris. The diverse range of exotic tree species and panoramic views, have made The Redwoods (http://redwoods.co.nz) one of Roturua’s great treasures. This forest is well-known for its network of superb mountain biking, walking trails and of course the incredible Silver Ferns (New Zealand’s national symbol) and Californian Coast Redwoods (wow, are these trees ever impressive!). We love to take in the outdoors, so for our last afternoon in the city, we decided to head for the woods for some hiking. 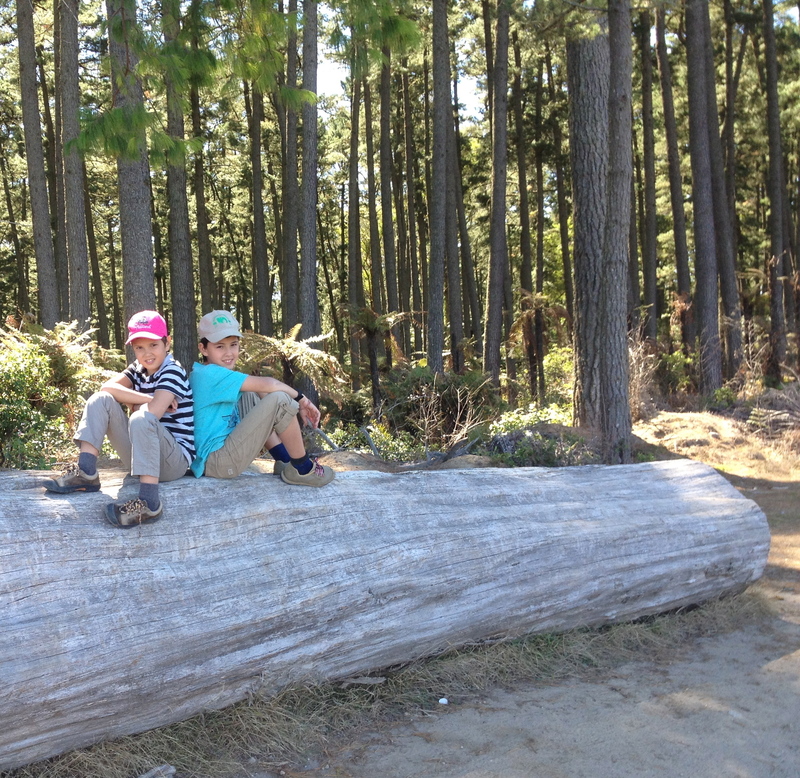 Our 2-hour hike just gave us a glimpse into the magnificence of this spectacular forest – but we thoroughly enjoyed it. However, there were some envious eyes towards the mountain bikers who were flying by and having fun on the expertly created and exhilarating mountain paths. A shame it was so expensive to rent bikes here, but the determination of my 3 boys is there now; let’s take up the thrilling sport of mountain biking once we are back! The delicious smells of pine and fresh forest air, the beautiful towering trees and the overall tranquility of The Redwoods really invigorated us all! 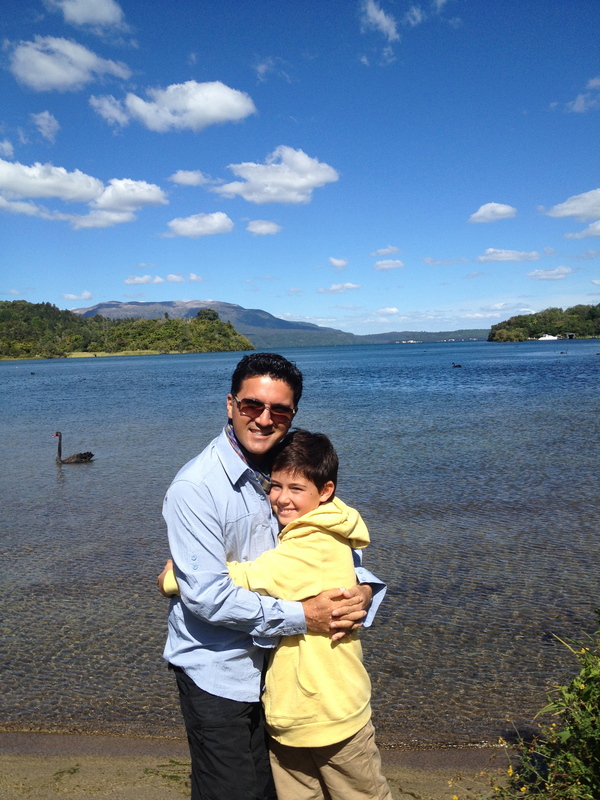 And with this last outing we said good-bye to Rotorua and hello to Taupo. 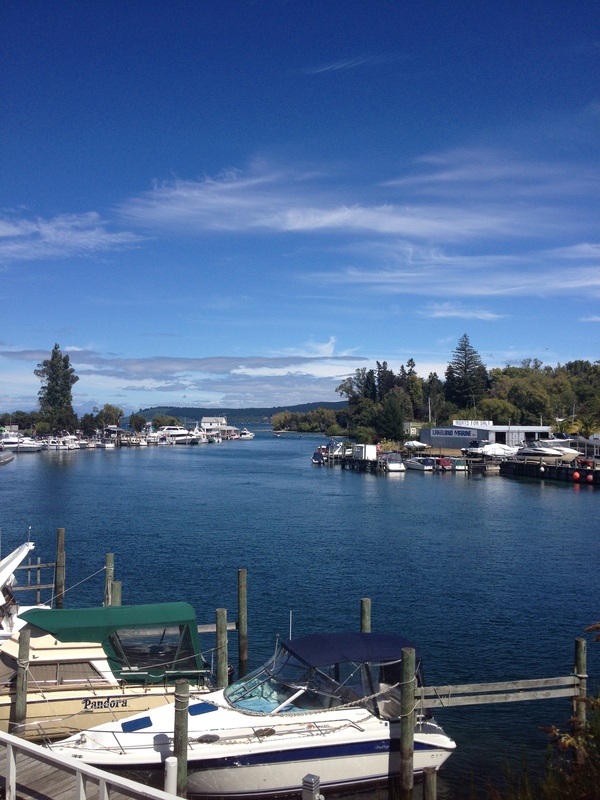 Beautiful Lake Taupo is New Zealand’s largest lake, and the city of Taupo sits at the edge of this body of water, besides the Waikoto River. 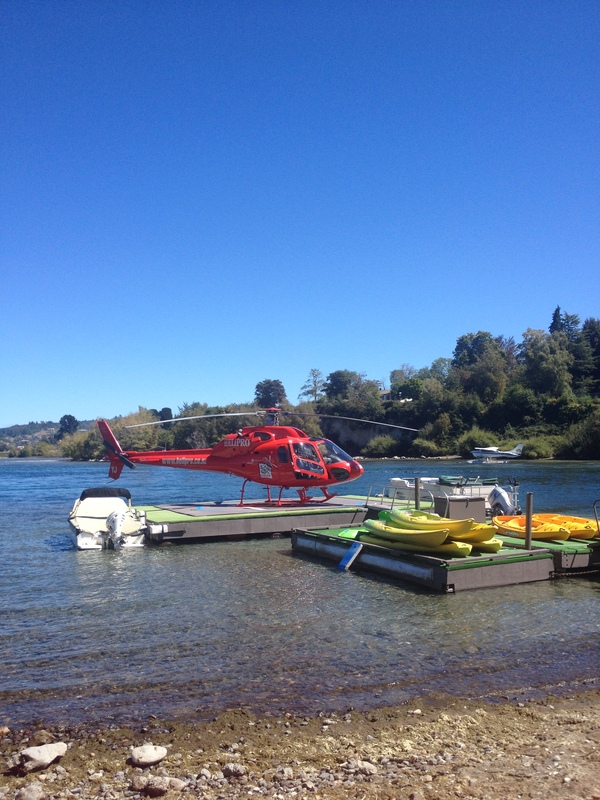 Taupo is known for its watersports, fishing (one of the last wild trout fisheries in the world) and adventure tourism. As soon as we drove into town, we were mesmerized by the views – there was this stunning big blue lake, with snow-capped mountains in the distance! Over the lake, there were red helicopters providing what I can only imagine were stunning aerial views, white parachutes dropping from the sky – providing the dare-devils with a thrill, and numerous sailboats and colourful parachutes (para-sailing). The Waikoto River flows over a spectacular waterfall called the Huka Falls. 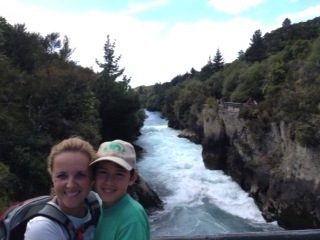 As Emile and I were in the mood for a hike, we headed a short distance north of Taupo, by bus, to reach these Falls. There, the water is forced through a narrow rock canyon and then thunders 11 metres down into a circular pool. 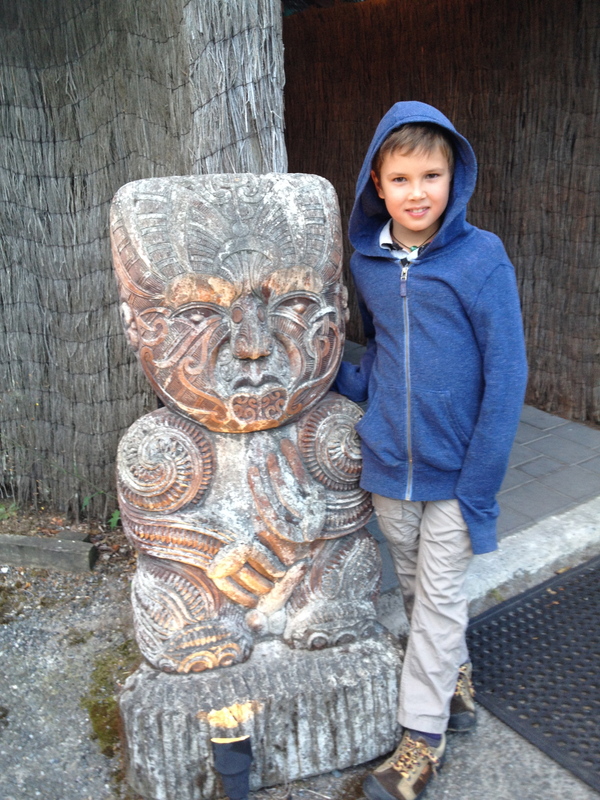 Appropriately, the Maori name for Huka means “foam”. We wanted to take a “selfie” at Huka and had fun doing so, although unfortunately the sunglasses that were sitting on top of my head made a plunge into the roaring water (thank god they were only the $5 kind from Cambodia)! From this spectacular water scene, we took the Haka Falls Spa Park; a track that follows the Waikato River above the Huka Falls. Emile and I enjoyed over 2.5 hours of fantastic views (unique trees, beautiful birds and the bluest of waters) and a great chat, while hiking back to town. On our way, we came across Anthony and Filou, who had decided to rent some mountain bikes (www.gordononline.co.nz/) and were doing their best to master the hilly path. 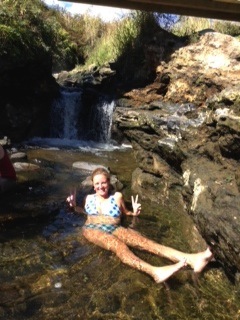 A little further on, we all came across a natural hot stream that flows into the cold river water. It was here that Emile and I bathed for a bit – a real unique feeling to sit in spa like hot tub in the middle of a cold river amidst the most beautiful of scenery. Y.O.L.O! We continued along and near the end of the walk, came across the Taupo Bungy Site (www.taupobungy.co.nz/). Here we stopped for a bit to enjoy the marvelous views down into the river’s gorge and see one brave soul plunge into the deep-end (my knees were shaking, just standing on the bridge watching him!). Emile thought he could do it, but I moved him along quickly….All in all, a great active hike and mother-son bonding time. For our one night in Tauranga, we checked into the Taipororo Mansion Guesthouse (http://www.bayofplentynz.com/main/product/?product=taiparoro-mansion), an absolutely lovely place that surprised us in every way. Memphis, the owner, was a friendly, bubbly artist whose works were displayed all over the gorgeous, well-kept mansion. After a very, restful night in a large poster bed, we took a nice walk along the water and realized how very beautiful Tauranga was (we thought it to be just a large port town but o, were we mistaken!!). While enjoying breakfast on the beach in the morning sun, I got chatting with two lovely, local ladies; one of whom was Panilla. This Swedish-Kiwi could not believe that we only had a few hours in Tauranga and was determined that we would not leave her town without seeing the “Mount”. As the kids were having too much fun, playing in a local park – Anthony stayed behind and I went off for a drive with this wonderful stranger! 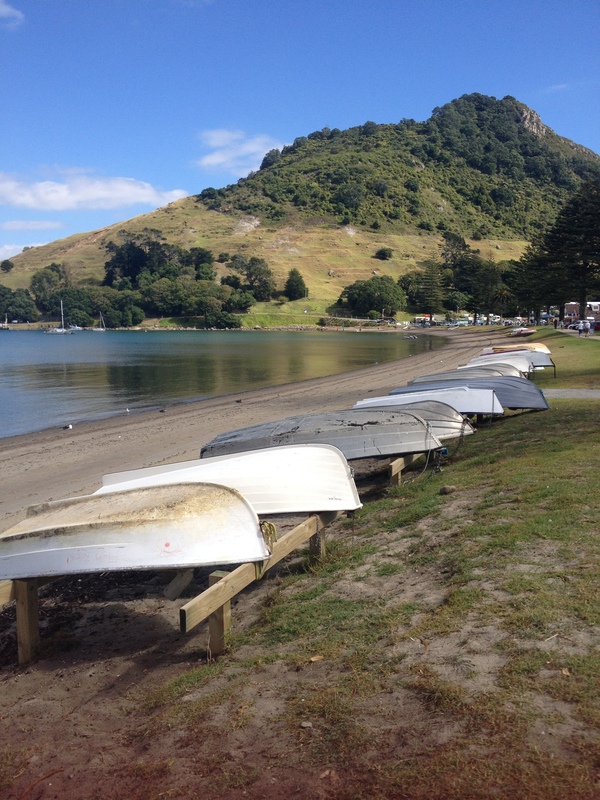 What I learned from Panilla was that “The Mount” is what the locals call Mount Maunagui, a lovely beach town that occupies a peninsula at the southern end of the Tauranga Harbour. The peninsula is a huge sandbar with a sheltered bay on the inner harbor side and a wonderful beach (fantastic for surfing apparently), on the Pacific ocean side. At the tip of the peninsula is Mauao, a dormant volcano, which looked like a large, green mountain full of sheep and lovely walking paths to me! Panilla told me that Mauao had just been given back to the Maoris, but that the walking paths were still open for everyone to enjoy. How I wished I had more time to take in this beautiful little harbour and lush greenery. But I enjoyed a lovely chat and coffee with Panilla in the lively area of “The Mount”, and hen raced back with her, in time to catch our bus to Auckland. And so after a last quick overnight stop in Auckland, we said good-bye to the 4 million Kiwis and 40 million sheep! I have tasted good lamb for the first time in my life and have enjoyed the superb Kiwi hospitality (thank you stranger Sylvia for driving me back from the Taupo Pak ‘n Save so I didn’t have to walk back to our hostel with 5 bags of groceries in the burning sun, Neil from Roturua Central Backpackers for letting us download tons of movies and giving Emile and Filou extra money for special chocolate drinks, when they didn’t have enough on them and Panilla for showing me her beloved “Mount” ). 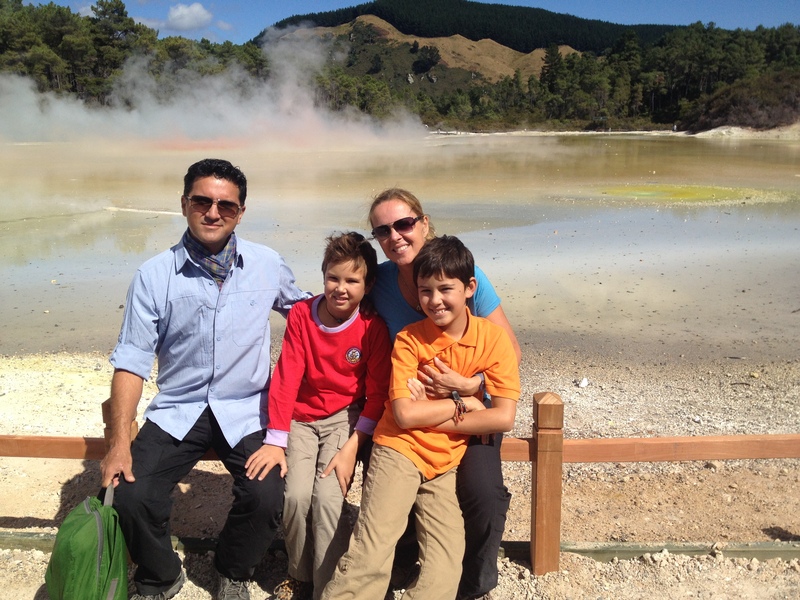 New Zealand, we have taken in your immense natural beauty; mud pools, volcanic craters, fumeroles , Ta Moko, hangi meals and L&P Whittaker’s chocolate; they were a first for us all! We hope to be back one day to take in your South Island, which many believe to be even more beautiful… E noho ra – Good-bye!